patent Bluetooth connection feature optional, enable IOS & Android app to monitor instant battery status(SOC, battery voltage, remain AH, charge current, temp., life cycle, error). 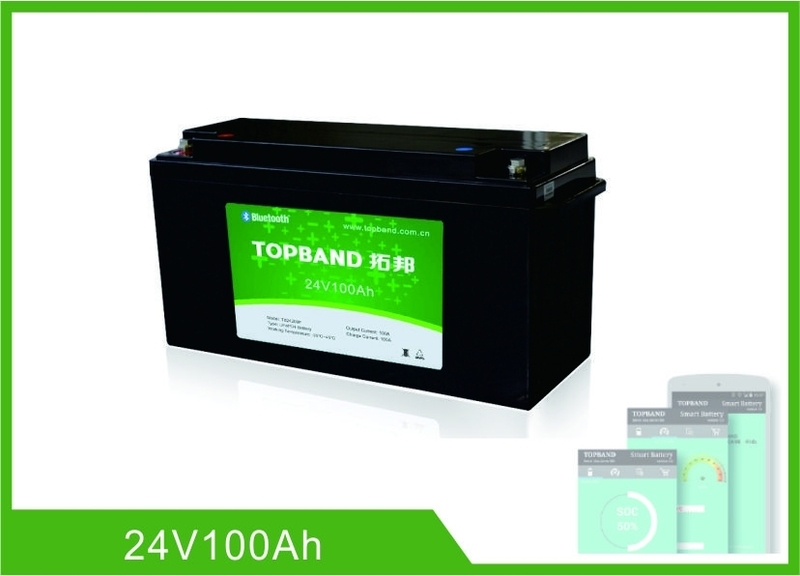 This specification defines the performance of rechargeable LiFePO4 battery pack TB-BL24100F-S110A manufactured by Shenzhen Topband Battery Co., Ltd, describes the type, performance, technical characteristics, warning and caution of the battery pack. 3. Electrical Characteristics & Test Condition. @Ambient Temperature 25±5℃ & Humidity 45%~75%. 4 MAX charge Current 100A Charging with this current for more than 0.5h and the added temperature of battery pack less than 20℃. 5 MAX discharge Current 100A Discharging with this current for more than 0.5h and the added temperature of battery pack less than 35℃. -20℃ 70% At 25±5℃ discharge the battery with the current of 0.33C to the cut-off voltage and record charge capacity. Store the battery at various temperatures for 2h and discharge the battery with 0.33C to the cut-off voltage.